This Whovian art print will delight any Doctor Who fan! 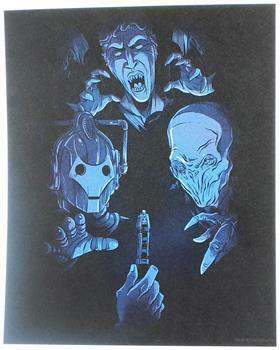 Measuring 8" x 10", this print sees our heroic Time Lord facing off in the dark with three of his well known adversaries. Sonic Screwdriver to the rescue! A Nerd Block Exclusive. This Whovian art print will delight any Doctor Who fan! Art print measures 8" x 10". Print sees our heroic Time Lord facing off in the dark with three of his well known adversaries. Sonic Screwdriver to the rescue!